Ministry of Propaganda - 26/Mar/2006: "London"
Having not been to London for a long time it was time for another visit yesterday. We had a tiny German blogger meeting: Schuer (who also blogs at Top 5) and his girlfriend were visiting from Berlin while Konstantin was our 'local' guide. A huge thanks to Konstantin for the excellent tour!! Ralf had also hoped to come, but unfortunately couldn't make it. Hopefully next time. After the cold the last few weeks spring like temperatures finally had arrived, unfortunately some time in the afternoon also some rain. Having met at Paddington station we travelled to East London where among other things we saw the place where Jack the Ripper murdered his first victim and the pub where Ronnie Kray killed his last victim. 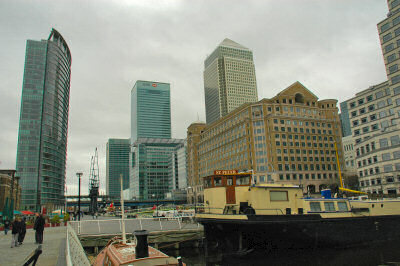 We then took the Docklands Light Railway to Canary Wharf to take a look at the skyscrapers. Next stop was Greenwich after walking under the Thames through the Greenwich Foot Tunnel. Unfortunately the rain was getting fairly strong, so after a quick glance at the Cutty Sark we went into a pub for a pint. We had planned to visit the Prime Meridian, but as the rain showed no sign of slowing (and we were running out of time) we decided to skip it and boarded the river cruise boat to Westminster instead. 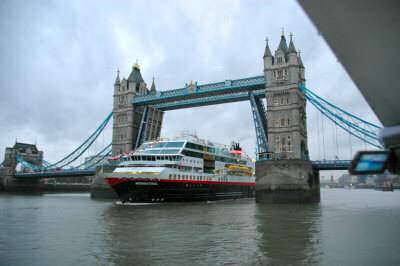 This probably was a good decision, as we had the opportunity to see the Tower Bridge being lifted to let a cruise ship pass through. The evening was spent in an Indian restaurant and various pubs in Soho before it was time for me to catch the last train (well, and a 'bus replacement service') back to Swindon. I'm planning to organise something similar in Wiltshire for some time in late May or early June. Stone circles, White Horses, earth mounds, country pubs, if possible crop circles and other sights will be on the list of places I hope to visit with the townies.